All of Dubai is in a tizzy tonight for the Euro Cup Final match between Germany and Spain. Not only does the city love 'football', but there are big German and Spanish expats communities here, so there are alot of fans! One of our favorite places to watch the game is at the Hilton Dubai Jumeirah Resort where they have a huge big screen outside on the beach. They are also known for creating signature drinks for both teams playing, complete with mini-flags! We have no idea where they procure them but they have them for every match. We watched the semi-final match between Germany and Turkey a few days ago and although I didn't really care who won, but as the future Mrs. Mueller (umlaut optional) I figured that I should cheer for the German team and of course try the signature "Germany" drink - not really original, just pineapple juice - but I did it for the teeny flag! Matt surprised me the other day when he strolled into the apartment pushing a shopping cart from the local grocery store (they call them 'trolleys' here). People grocery shop here much like they do in Europe, meaning they go almost everyday to collect fresh fruit, bread, and milk. We just can't kick our American ways ie. we need cereal for two weeks and buy enough frozen pizzas to get us through next weekend! Apparently they felt so bad that Matt was going to truck all these bags home himself, that they let him take a shopping cart, which he happily wheeled through the lobby of our building, up the elevator 28 floors and into our apartment! To complete Lisa's 'rite of passage' weekend we concluded with a day of off-roading, aka dune bashing in the dessert. We were up at 7:00am, with our dessert gear - water, sunscreen, and old clothes - and ready to go! It was quite a feat considering that we went to bed at 2:00am the night before. Nonetheless, we were in high spirits when our friend Imad picked up in front of our building in his new black Hummer H3, complete with an American flag emblazoned on the back window (this guy is just asking for it). It's almost an hour ride to the neighboring Emirate of Sharjah which is not nearly has developed as Dubai, and has some pretty pristine dessert to experience. We stopped on the way, as we always do, at a gas station to fuel up, let air out of the tires for the dessert, and buy ice cream Snicker bars for breakfast. I highly recommend this! This stop, however, something caught my eye. There it was all cute and cuddly, with long eyelashes, a tan coat, and four legs inexplicably shaped like bell-bottoms: the cutest camel stuffed animal ever. I showed it to Lisa who immediately said "we are not leaving without that". As Matt was already in the midst of checking out we rushed to the front and slid him across the counter, just in time to have him rung up. Matt didn't have time to stop the transaction but did add "you can't be serious". We decided to name him Locochino, yup that's right. (As a bizarre back story, I had had a dream the night before that Lisa told me that she planned on naming her first born son, Locochino. We figured it was a sign). He was a welcome addition, as you can see in the pictures, to our dune basing group, especially when Lisa needed something to clutch when she was screaming her head off. Also, despite designating Locochino as our good luck charm, we had several mishaps. I couldn't stop getting sand in my eyes so I had to borrow Basile's goggles, Lisa fell asleep in the car for lack of eating breakfast and Imad managed to get himself and the Hummer stuck in the dessert 4 times, we think it had something to do with that American flag! For your viewing pleasure, check out the video below of Lisa's first dune bashing experience. Last Friday I experienced my first Dubai brunch. I attempted to have some breakfast but Katie and Matt intervened and convinced me to wait for what was ahead From the all you can eat buffet and a la carte menu, to the unlimited champagne, to the tequila shots at 2pm… it was quite an experience. It's not everyday that you sit down and eat eggs Benedict, fillet, tortellini and red Thai chicken curry all in one sitting. And don't forget the dessert table! Of course, after all this indulgence a "food baby" was inevitable. For those of you who don't know.. I'm sure you can use the context clues to figure it out. Matt, who also is a victim of the "food baby", gave me a "baby bump"for solidarity. As with any Dubai experience, excess is necessary, so after brunch we moved on to Barasti (my new favorite spot in Dubai). There we watched the sunset and somehow managed to continue eating (mini-burgers and hummus anyone?) and then moved downstairs where we sat in the sand by the Persian Gulf and relaxed in the beach chairs. By the time we got home it was after 10pm and we set our alarms for 7am to wake up for dune bashing the next day! The weekend always starts with a bang in Dubai, and this Thursday kicked off a whirlwind of a weekend where Katie and Matt wanted to expose me to several "signature" events. The first of which is the requite night at Chi at The Lodge where dancing the night away under the stars (literally under the stars -it's an outdoor dance floor) is practically a right of passage. We had a great time soaking up the ambiance with our friends Imad and Dan, and of course the night concluded with some delicious shawarma! More to come on signature events Part Deux and Trois, brunch at Yalumba, and dune bashing! Everybody loves a good zoo, and as Lisa and I are no different we happily planned a trip to visit the Dubai zoo last Wednesday to see the establishment that was established in 1971 an boasted many exotic and unique Arabian animals. 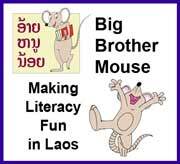 Although we knew there was a zoo, almost every major guide book failed to say anything about it and the address itself was hard to find. That's no way to drive tourists to your zoo! This should have been our first clue to turn back while we still had a chance to live nightmare-free. We eventually found it by following our noses. The smell of, um, animals...lead us right to it when we excited the taxi. I will refrain from sharing my full opinion of this establishment for Matt would rather my full feelings on the issue not be public domain in a monarchy. The conditions are appalling, the animals are sick and weak, there are no 'habitats' only small cages with cement floors and walls, and the animals live in there own filth while drinking dirty water. As one point I turned to Lisa and asked truthfully, "Can animals be depressed?" If so, I now know what their faces would look like. The entire experience was disturbing and heartbreaking, especially the gorilla who just sat in her cage unblinking, staring right through you, as if to say "why"? Timeout Dubai's guide book calls it 'shameful' and dares you to visit 'if your conscience allows'. That pretty much sums it up. We got tricked last Thursday evening. Just when you think you've got the nightlife scene all figured out, you go and get duped! On Thursday night we were looking for an opportunity to give Lisa her first proper night out on the town, so after wine and cheese, we returned to the apartment to get gussied up while the boys debated our intended destination. 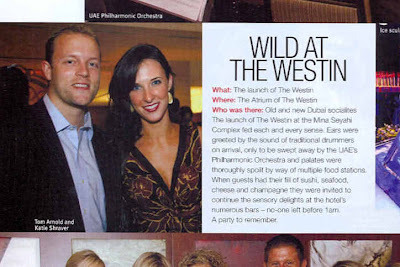 The hot spot of the hour (because that is the longest you get to be cool in Dubai until something newer than you pops up) was the New Asia Bar at the top of the Raffles hotel. Apparently it is the see and be seen place 'du jour' and therefore we wanted in! The only weird thing is that we've been to the top of the Raffles hotel many times. There is a really nice, quiet, champagne lounge up there, called the China Moon Champagne Bar. So we called around to confirm that we were supposed to go to the top of the Raffles hotel to the New Asia Bar and not the lounge. We were told that the venue was brand new, and that it was a club not a lounge, and that it was really hard to get into. Didn't sound like the place we had been before so we decided to check it out. Sure enough we arrived and were immediately engulfed in a swarm of people at the entrance to the venue. Everyone is trying to say they are friends with someone inside, that they have a table reserved, and giving the bouncers the "you don't know who I am" speech. Lisa said that the crowds were of NYC caliber, and that she couldn't believe how popular the place was. So the mystique surrounding this previously undiscovered place was on the rise! The situation seemed almost hopeless when Matt approached the bouncer and tried a different angle, "I've got two hot girls! Look at all these guys in line" he screamed. As with any self-respecting club, that was the golden ticket we needed. How could we have forgotten to exploit the girl-guy ratio! We were ushered into the elevator for the ride to the top of the hotel and when we were released at the entrance of the "NEW" Asia Bar, we realized that it was just the "OLD" China Moon Champagne Bar, but nothing had changed but the name, a DJ and the new steep cover charge. Genius. Someone better give their marketing team a raise. You've watched "The Office", and by golly, you may have even worked in one. But turning around your normal, run-of-the-mill organization doesn't require just leadership, it requires...cardboat boats. For our training retreat, the staff of University Hospital learned that the secret to success lies in beating your fellow men and women to the buoy in a dingy made from a box, duct tape, and tarp in less than 30 minutes. 3 appliance boxes, 10 rolls of duct tape, and a plastic tarp: 70 dirhams. 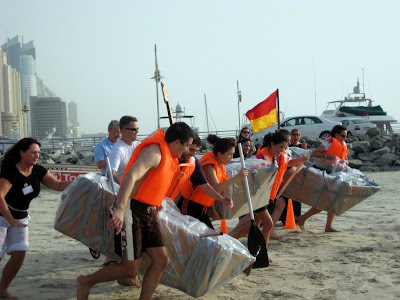 Two paddles, two life vests, and a bunch of elbow grease: 140 dirhams. Getting out of the Gulf and popping the grape cider next to your new CEO: priceless. As excited as I was about my fabulous new room, opening my computer for the first time since we arrived put a major damper on my mood. I was hit with the Blue Screen of Death (known in the industry as the BSD)! Matt has been working around the clock to fix it but thankfully Katie saved the day by having an old laptop for me to use. Later that night, after a 6 hour "nap" Katie and Matt treated me to a dinner at Barasti bar, a trendy outdoor venue right on the beach of the Persian Gulf. Yummy! After hibernating all day Wednesday and unpacking, on Thursday Katie surprised me with a 75 minute massage from the local spa downstairs. It was the best massage of my life! My masseuse Maria engaged in acrobatics that would rival those in Cirque du Soleil. I will be visiting again soon. Sorry guys, you won't get your chance. No men allowed! Thursday (the start of the weekend in Dubai) we indulged in the previously blogged about wine and cheese night at the Qamardeen. My favorite cheese was the Fontina! We made sure to get plenty of energy for the night ahead. After wine and cheese, Matt swindled our way into the new night life hot spot the New Asia bar at the top of the Raffles hotel. We danced the night away to some old 90's hip hop tunes an didn't leave until early morning in search of Papa John's. On Friday, we attended a little pre-party at one of Katie and Matt friend's apartment. We ended up staying there the whole night and I got a chance to meet the rest of their friends, including Katie's friend Emma, who is sitting with us. Saturday, we went to the Mall of the Emirates, the largest mall in the Middle East and home to the famous Ski Dubai. We met up with friends Emma and Dan at Apres the restaurant that overlooks the slopes. We shared fondue, and watched the tykes wipe out on the little snow boarding slope. On Sunday, I got a chance to hang out at the pool while Katie and Matt were out working, and we all had dinner together at Nandos, a popular UK chicken joint that just opened in the bottom of our building. And on Monday morning I was lucky enough to have my first job interview! Wish me luck and stay tuned! In Dubai the occasional libation isn't hard to come by, although it is illegal to serve alcohol unless you are a venue connected to a hotel, there are plenty of hotels to come by, so we are spoiled for choice! However, of the bars and restaurants that do serve alcohol, pub-style places are much more abundant than wine bars, so we were thrilled when the Qamardeen hotel next to our apartment opened and began advertising a wine and cheese special on the weekends. On Thursday, we headed over to see what it was all about. For 99 dirhams each we were treated to a 3 hour unlimited wine and cheese offering including our choice of a house sparkling, red or white, 20 types of cheese, fruit, quiche, fresh bread and crackers and dessert! Matt, Lisa and I had a great time chowing down on our pure dairy dinner while Matt regaled us with stories from his work day which consisted of building a cardboard boat and racing his coworkers in the Persian Gulf/Arabian Gulf (yes it can be called by both names) - more on this story from Matt soon! Everything was tasty, and the decor was that of an Arab W Hotel, if you can picture it. Not to mention our waiter, from Kenya, kept the jokes coming all night so we left satisfied and in a good mood to start the weekend! Beyonce may have brought the word 'bootylicious' into the American vernacular, but I believe that Dubai just might have their own special "-licious" word designed just for them. Let's just take a moment to soak that one in. On a recent trip to Spinney's (our grocery store) I was showing Lisa around for the first time, when she spotted this in the dairy section. Not just any camel's milk, but strawberry favor! Yummy. Just look at that camel logo, this guy is giving the Nestle Quik rabbit a run for his money. All kidding aside camel's milk is supposed to be really good for you. It has been called a 'super food' since it is so rich in protein, vitamins and minerals. In any case, we passed. After the momentary shock and interest regarding the camel's milk, Lisa's eyes fell on another product in the dairy section that made her feel much more comfortable. Ah, home sweet home. It's not every day that someone says they saw you in a magazine, but that is exactly what happened my second day at my new job. I was sitting in my office getting acquainted with my laptop when the girl across the hall came over to introduce herself. After shaking her hand and chatting for a moment she said, "I've seen you before in a magazine." I thought it was a joke, or at least lost in translation (she has a thick Romanian accent), so I said "you mean you think I look like someone in a magazine?" "No, no" she replied, "it was you. Did you go to a hotel opening recently?" Then it started to click, I had, a few weeks before attended the swanky launch of the new Westin hotel (previously mentioned in this blog) and while in the lobby there were a few press people taking pictures and noted names. I was asked for a picture with my friends Tom and Imad - Matt was out of town on business in the States at the time - when we walked in and I never knew anything was going to come of it. She had forgotten which magazine she saw the picture in, but I narrowed it down to a few that I though were likely. 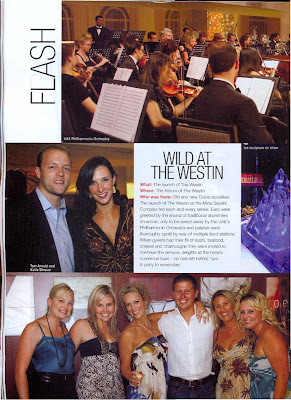 After a bit of detective work, sure enough, there I was on page 22 of 'Society Dubai' magazine. The magazine's website describes itself as "a monthly magazine with its finger firmly on the pulse of Dubai's emerging 'new society'." and says "Dubai is a busy city and if you blink, chances are you'll miss something amazing. 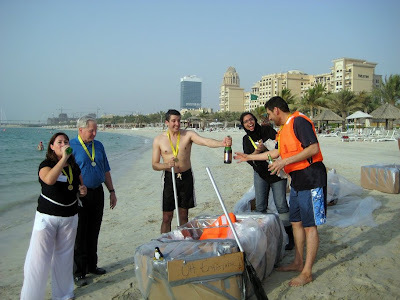 That's why Society Dubai is dedicated to bringing you the goings on each month. With in-depth features introducing our hottest new talents, names and faces, you can be assured that you'll be kept in the loop. " They, of course, got my name wrong "Shraver", but the funniest thing about the whole picture, is that our poor friend Imad was cropped out! He was standing on my left at the time and he disappeared in the version that went to print! I thought things were a little strange when we returned to Dubai. For one, traffic during the day on the busiest road in the Dubai was noticeably light. When walked to the bottom of our building to grab a salad for lunch I found that the four restaurants there were closed. Finally, when we switch on the radio every single station was playing traditional Arab music or reading from the Koran. After a quick check on the news, I quickly found out that the brother of the President of the UAE and Sheikh of Abu Dhabi, Khalifa bin Zayed Al Nahyan had died in a tragic helicopter accident just a few days ago. There aren't alot of details on the accident, but they are reporting that the helicopter with the Sheikh's brother and a few colleagues crashed into the Gulf while they were flying. Dubai, along with the six other emirates are in a three day mourning period. Most government offices are closed and all outdoor activities including seating at restaurants have been brought inside. The restaurants at the bottom of our building are owned by Emaar, a government entity, so they were shut down. 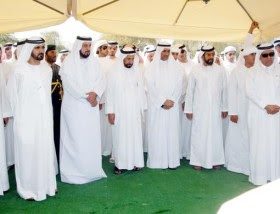 The funeral was attended by a number of high-profile leaders in the UAE and the President has reported been receiving condolences from all over the world. Our precious cargo has finally been transported to Dubai. After many months of planning, Matt and I attended Lisa's graduation from Temple University, and after her graduation party and a subsequent week of vacation at home in PA and DC, we scooped her up and brought our new graduate to Dubai. After 20 hours of travel we arrived safely in Dubai, to a brisk 102 degree day! For her birthday I set up a room just for Lisa to enjoy during her time in Dubai (we aren't sure how long that will be yet). She loved her room so much that just an hour after arriving she decided to test drive her new bed, complete with the eye mask from Emirates airlines! Fresh after her 6 hour mid-day nap (thanks jet lag) we decided to take her out for her first dinner in Dubai. Our friend Basile joined us at Barasti bar on the beach and we had a great time hanging out, especially when we convinced Lisa to smoke the hookah for the first time. A rite of passage! All was well until we finally checked a watch to learn that it was 1:30am on a school night! (again, thanks a lot jet lag) Stay turned for more adventures from little sis Lisa, and a guest blog post or two!